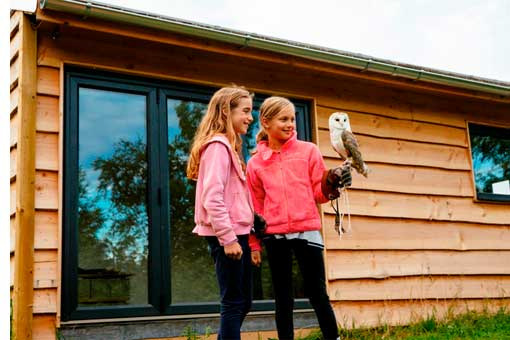 Children enjoying an eco-adventure at Camp Kernow, an educational not-for-profit organisation based near Truro in Cornwall, are now enjoying the benefits of an Aspect bi-fold door, after Eurocell and Victoria Windows and Doors donated and installed one in the camp’s winter classroom. “They’re working fantastically, they’re ideal for us because they let in so much natural light – and we’re off the National Grid, so that’s important,” says Charlie Nicholson, the manager of the centre. “It also allows us to get the children into the classroom far more quickly than a normal door for briefings and workshops”. Camp Kernow is an is an award-winning not-for-profit organisation with an innovative environmental adventure centre that runs school camps, workshops and summer camps dedicated to educating children about sustainability, renewable technologies and the natural environment. “This was a natural fit for us,” says Ian Kernaghan, Product Manager “And enables us to put something back into society and to champion environmental values with a product that’s both sustainable and energy-saving”. The doors were fabricated and installed by Victoria Windows and Doors, which has been manufacturing the Aspect bi-fold since it was launched. “It’s been very successful for us in the South West,” says Cheryl Anthony, who owns the business together with her husband Graham. “We supply to trade customers as well as several new-build projects here for Westhaven Homes in Thorverton and Heritage Homes in Exeter, which has installed them in a carbon-neutral development. We also get a lot of enquiries from self-builders”. Find out more about Camp Kernow at campkernow.org.uk. Contact Victoria Windows and Doors on 01884 829302 or visit victoriawindowsdevon.co.uk.